Triathlon Australia is thrilled to announce the induction of inspirational triathlon and Australian sporting great, two-time Paralympian and English Channel conquerer John Maclean, into the Hall of Fame this year. John will be formally inducted at the Celebration of Champions Annual Awards dinner, hosted by Triathlon Australia on the Gold Coast on Sunday night. McLean’s is an inspiring story – one of pure determination and extraordinary dedication to overcome the odds. A talented triathlete in his own right McLean was out on his bike, training for the 1988 Nepean Triathlon when an encounter with a truck dramatically altered his life path forever. He returned to complete the Nepean Triathlon in 1994. Suffering three breaks in his back, the one time rugby league player and all-round sportsman was left a paraplegic. It took years of recovery and rehab, but by 1995, with drive and determination to overcome the odds, MacLean was ready to challenge the notion of disability and he attributed his ability to do so, to triathlon. In that year, he headed to the Hawaiian Ironman Triathlon with the goal of reaching the finish line before the 17 hour cut off time, but it would take three more attempts. In 1996 MacLean competed in and won the newly created category of ‘Athletes with Disabilities’ at the ITU Triathlon World Championships. In large part the category was created in recognition of MacLean’s leadership and capacity. He also returned to Hawaii in 1996, reaching the finish line well under the overall cut off time. Unfortunately, his achievement was not official as he missed the bike cut off due to a puncture. 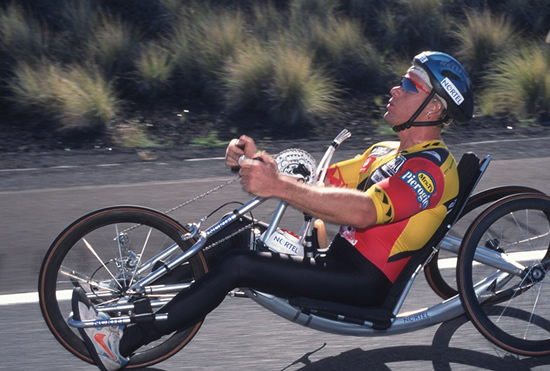 In 1997, Maclean finally became the first disabled athlete to finish Hawaii within able-bodied cut-off time, completing the race in an extraordinary 12 hours 21 minutes. Several weeks later he also competed at the ITU Triathlon World Championships in Perth to retain his world title. Yet triathlon represented the starting point for a life full of notable achievements for MacLean, who became the first paraplegic to swim across the English Channel in 1998. In 2000 he competed in the 1500m-wheelchair race at the Sydney Olympics and was also a member of the Paralympic team in 2000 and 2008 when he turned his talents to rowing winning silver – in the mixed double sculls with Kathryn Ross. In line with his ongoing athletic endeavours, which continued into the new millennium, MacLean sought to provide inspiration and opportunity to other people with disabilities. His latest astounding achievement - regaining the use of his legs and completing the Nepean Triathlon without a wheelchair in 2014 - represents not only MacLean’s extraordinary capacity to push his physical limits, but also the extent to which he has challenged the notion of disability. John MacLean has not only challenged the idea, he has shown it to be anachronistic, inaccurate, and irrelevant. Triathlon Australia will also pay tribute to four legends; Craig Walton, Rohan Phillips, and two champions now deceased, Fred Knudsen and Ched Towns. Technical awards - including presentation of the John Ison award and Rob George Award.